We are delighted to share our report from the inspection team who visited our school in March 2017. We are proud of our achievements and we will continue to work to maintain the high standards in the school. 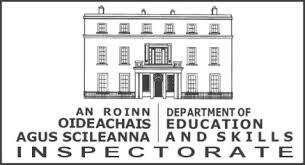 I would advise reading the Inspectorate’s Quality Continuum at the end of the report before reading the report as the inspectors are limited in the language used in reporting. Please click on link below to access report.